The internet's largest libertarian art site! ← New Cartoon: The Social Media Monster…? Will this be our future? Don’t miss this amazing and extremely thought provoking dystopian short story on the advance of progressivism and leftism! Maria on facebook says in regards to the story that it’s like, “George Orwell reincarnated – with a dry wit“. Rob says, “I wish there were a progressive rock band that would turn this into a concept album. At times it sounds like 2112.” Enjoy! To my fellow Associates: My name is Diversity-26, although my family and friends knew me as John before the Great Purge of Christianity. Today, as part of my punishment, I have been required to give you my story and beg you all for forgiveness for having disrupted your safe and happy lives. According to the decrees of Democratic Socialism (or Dezism), I am a non-binary citizen of the Commune of Equality. The year is 142 E.T. (Era of Tolerance), and I live in the Quadrant of Purple, which is now referenced in history as The Great Wicked South Carolina by our State Educational Officers. Some of you may recall that I once wrote for <censored> before the Egalitarian Uprisings of 2020 P.T. (Pre-Tolerance), and the subsequent instituting of the Holy Doctrines of Leftism. In the years following, I was drafted into the Grand Army of the Antifa to fight the endless Wars of Southern Fascism – which many of our brave Associates continue to fight to this day. I served Rainbow Nation with honor, and was discharged seven years ago after losing my right arm and being blinded in my left eye by Fascist Free Market Shrapnel. 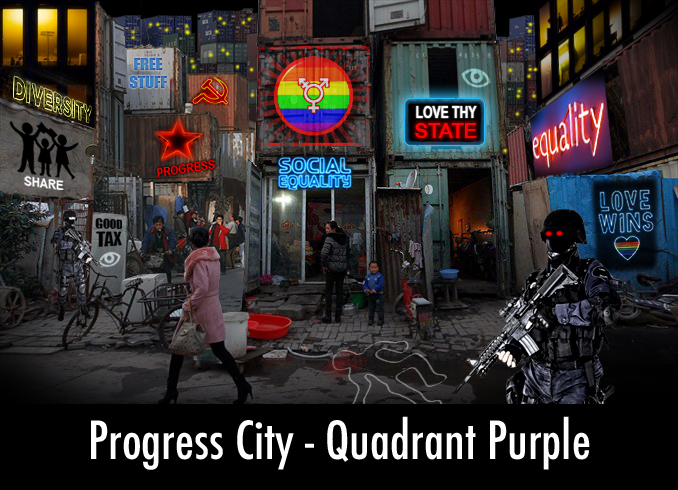 As tribute to my service, I was allowed to live within Progress City, a vast complex of prefabricated structures and shipping containers provided by our benevolent Dezi Party Officials. It was here that my Associates and I lovingly contributed to the advancement of Secular Multiculturalism and The Great All by encouraging positivity and harmony throughout the Quadrant of Purple. Some of the ways we shared in this happy task was through eliminating and censoring any images, artwork, books, movies, historical artifacts, music, etc. that may give offense to any group protected by the State. I am proud to say that we performed our tasks with remarkable efficiency, and 452,975 pieces of illegal material were incinerated under my watch alone. But as stated by the Holy Doctrines of Leftism, it’s only a matter of time before the sins of individualism, agrarianism, or capitalism burst forth and must be purged. My first offense was during the daily Weeping and Gnashing over the Crimes of the Past. The non-binary pre-pubescent life form the State provided me with happened to fall asleep during the ritual, and because I didn’t want to be arrested for being a poor role model, I woke them up. However, my child felt their status as an Equal was threatened, and promptly contacted their Public School Watcher, who then notified the Hallowed Halls of the Southern Poverty Law Center. Thankfully, due to their dedicated inquisition, it was soon discovered that I had not only committed one, but two Equality Infractions. The second was for neglecting to let my dog sleep in my bed with me on a cold night. For both cases, I was placed on the SPLC’s Map of Hate, and all Associates in the Commune of Equality were notified that I was a potential Child and Animal Abuse Predator. My third offense occurred while communicating with friends on the Social Network known as Twitbook. I foolishly shared a photo of what I mistook for a beautiful statue that I discovered in a densely forested area beyond Progress City. Although Twitbook algorithms ensured that only a limited few saw the image (unless I paid a special tax to boost the image to a wider audience), the Twitbook Internal Artificial Intelligence Network recognized the image as a potential violation and promptly notified the proper authorities. State Peace Enforcers quickly responded, and identified the picture as something called a Racist Remnant of the Putrid South. After deleting the image and offering grief counseling to those who had seen the offending image, they then put me on a weeklong suspension from the network. I don’t know what the Confederacy was or how it was associated with this statue, but now, praise The State, I know it was a despicable thing. Furthermore, I have been assured the actual artwork will soon be destroyed secretly at night for the safety of all Associates throughout the Quadrant of Purple. The High Priests of Tolerance had been merciful to me thus far, but the fourth offense I committed could not be ignored. I shudder to even mention it, but I was caught reading a book I should have liquidated. It was an ancient Book of Barbarism called Uncle Remus. I’m sorrowed to say that I was quite captivated by a picture in the front featuring an unusual white haired, dark skinned person talking to a rabbit. The stories within amused me, and made me think that perhaps those wretched people of the past might not have been as terrible as our schools, movies and books have lead us to believe. Of course, I now know this is false, as I was later reassured of the truth of Statism by being made to watch 72 hours of non-stop recordings from CNN, Fox News and Great Thinkers like Eric Foner and Bernie Sanders. And so this brings me to the present. Fellow Associates, know that today I do not kneel in shame or embarrassment before you like a traitor, but that I stand proudly before you and our Rainbow Flag on global news feed. Like you, I have pledged allegiance to our State, and long ago signed my Oath of Loyalty in blood. I admitted to my sins against Rainbow Nation in Court, and was rightly sentenced by the Social Justice Tribunal for Political and Cultural Crimes against Life. As such, I will joyfully serve out 24 years of Equality Sensitivity Training at The Peaceful Way Re-education Gulag. This is likely the last time you will hear from me – for a while, at least, but hopefully not forever. Still, if it is, so be it. The State gives, and the State takes away. Blessed be the name of the State. Also seen at Abbeville Institute: The Left Edge of Insanity and at Lew Rockwell.com. Be sure to check out our cool store for your totally unique libertarian / voluntaryist / anarcho-capitalist / Rothbardian t-shirts, cups, mugs, notebooks and more! Click Here! As always, thanks for coming by and have a great day! This entry was posted in Uncategorized and tagged 2112, antifa, bernie sanders, Democratic Socialism, dystopian, Egalitarian, equality, Eric Foner, fascism, fiction, George Orwell, left, leftism, Lew Rockwell, Multicultarialism, Oath of Loyalty, progressivism, short story, social justice, Southern Poverty Law Center, statism, tolerance, Uncle Remus. Bookmark the permalink. Infographic: Act Violently Against Peaceful People??? Libertopia Cartoons on Blast Off! With Johnny Rocket!! !